Well the day is here: the day when a non-alcoholic beer is also gluten-free, or other side around. While the gluten-free beer trend never really took off, non-alcoholic and low-alcoholic beers have become really popular to the point that Labatt and Molson have both created non-alcoholic beers that are getting a lot of publicity in the media, as well as getting sold at some of the more popular chain restaurants lately. 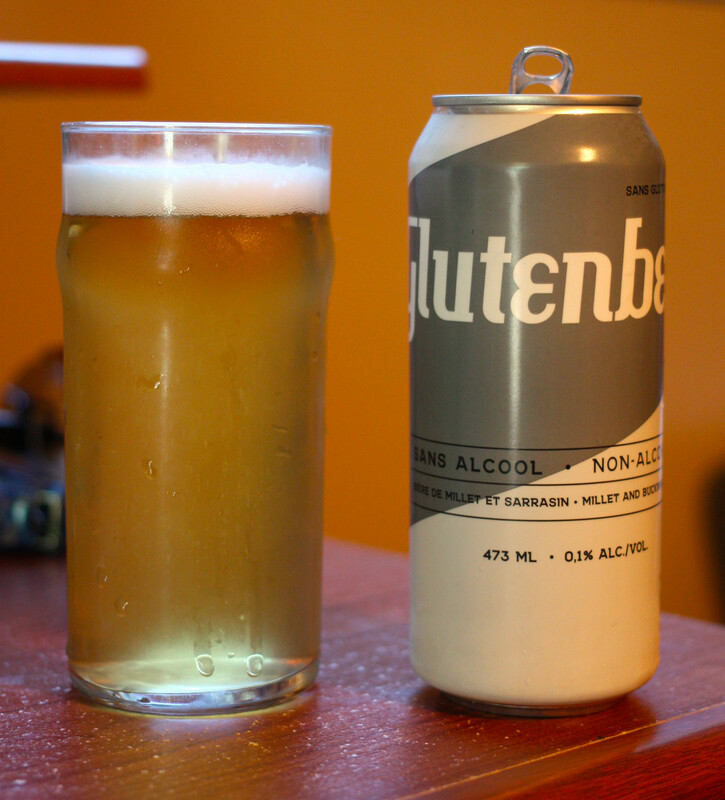 Glutenberg (Brasseurs Sans Gluten) out of Montreal recently released a gluten-free non-alcoholic beer that contains only 0.1% alcohol, which is enough to still be considered within the range to be considered non-alcoholic. The beer contains water, millet, buckwheat, corn, maltodextrine, hops and yeast. Only 59 calories per 473mL serving.. so drink up! Appearance: This definitely looks like a beer, so far. Glutenberg's lightly cloudy with a light straw yellow body to it. There's a heavy amount of carbonation in the body, typical for a lager-style beer. The head is thick, white and foamy with there being a liberal amount of lacing once the beer goes down a bit. Aroma: Fairly light but surprisingly pleasant so far. There's a nice hop profile to it that I'm thinking could be Sorachi Ace, giving off a light dill aroma to it. There's notes of lemon, a bit of a grittiness of buckwheat, and slight earthiness at the very end. Taste: I'm finding this to be one of Glutenberg's lightest beers yet, it's quite watered down.. but just about everything I said about the aroma seems to be there - it has a light dill flavour to it, a good amount of lemon, the taste of buckwheat (still pretty faint) and a pretty large metallic aftertaste that lingers for quite a while after drinking the beer. Overall Thoughts: This definitely isn't the worst non-alcoholic beer I've ever had, but neither is it the best. It's a bit too light on taste, but the taste itself isn't bad, so if you are familiar with their Glutenberg Blonde already, you'll kind of know what to expect from this beer. For now, this is only available in Quebec. I think that eventually it will be available elsewhere in Canada and the United States, but time will tell. Seeing that non-alcoholic beers seem to be some of my top-rated reviews, I'll eventually review the new Heineken and Coors Edge non-alcoholic beverages in the near future, so stay tuned. Merci Nicolas over at SipShare.com for getting me a couple samples to try!